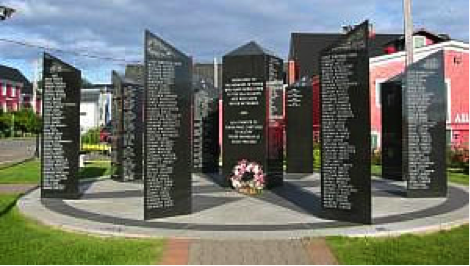 On August 25, 1996, The Fishermens’ Memorial was unveiled in Lunenburg. It is located on the waterfront between Adams and Knickle and the Fisheries Museum of the Atlantic. The monument shaped as a compass rose, comprises eight three-sided columns at each compass point. Inscribed on these black granite columns are the names of mariners, primarily fishermen from Lunenburg County who lost their lives at sea from 1890 until the present. 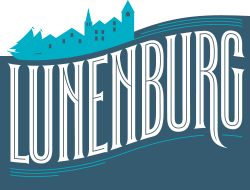 By erecting this monument the community of Lunenburg has reaffirmed for all time that the fishing industry has shaped their lives and that they recognize the sacrifice that fishermen have made in order to make a living from the sea. 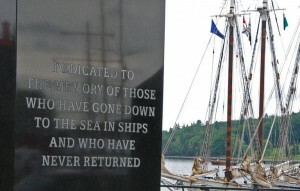 There is also a Fishermen’s Memorial room located on the second floor of the Fisheries Museum offering an evocative tribute to those lost at sea from the port of Lunenburg.